Anyone who believes we're nearing some sort of saturation point with the two hottest device classes of the moment -- smartphones and tablets -- ought to check out this latest data from investment bank RBC Capital Markets. It shows an estimated 394 million people already possess one of these newfangled gadgets, and -- while we don't consider the world's population a relevant metric here -- sets that number up against some other illustrative stats.The most important one for smartphone growth is the tally of mobile subscribers, which stands at just over five billion presently and dwarfs any inroads that smart mobile devices have made to this point. The total of nearly 1.3 billion PCs should also be encouraging for companies seeking a market for their tablets, as it quantifies the sheer volume of computers we use and need. So, next time anyone asks you if it's "too late" for Nokia to right its smartphone strategy or HP to deliver its tablets, you can juice up your negatory response by dropping this statistical knowledge bomb. 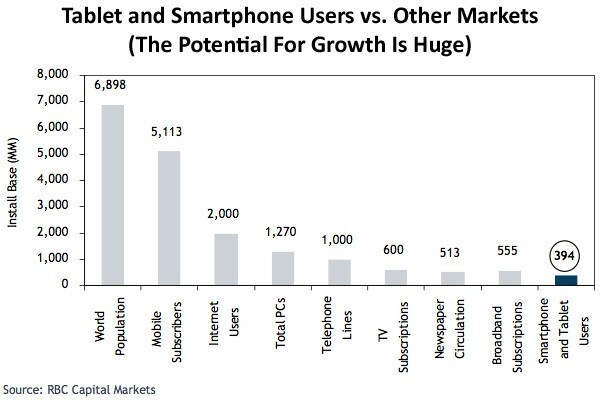 Smartphones and tablets still have a long way to grow originally appeared on Engadget on Fri, 04 Mar 2011 09:07:00 EDT. Please see our terms for use of feeds.